Outdoor Fitness Magazine review - BEST ON TEST - 9 out of 10 stars (or squares). Verdict - A brilliant introduction to the world of 27.5" wheel mountain bikes, and a compelling all-rounder, climbing well and inspiring confidence on technical trails. - Outdoor Fitness Magazine April 2015. As the lone female competitor in the men's golden category, Ica Maximo powered by YKKBikes.com finishes 2nd place overall of the Bike for Hope Challenge last August 15, 2015. The 16 year old, Grade 10 student of Sacred Heart School-Hijas de Jesus made her move in the last 15 kilometer of the 47 kilometer cycling event and pedaled her way out of the pack but was upstaged by Danny Ermitanio who won the overall title by 5 mins in the last climb of the stage. 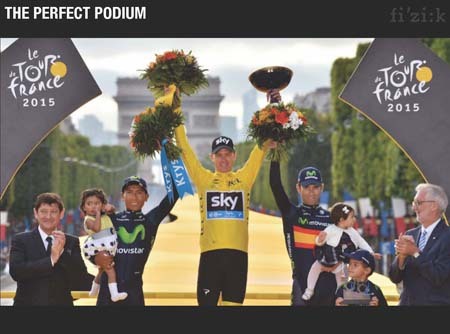 TEAM SKY’S CHRIS FROOME, ABOARD HIS FI’ZI:K ANTARES 00 SADDLE, HAS WON THE 2015 TOUR DE FRANCE. AFTER THREE WEEKS AND 21 STAGES, THE 30-YEAR-OLD RACKED UPA WINNING MARGIN OF 1:12 MINS OVER MOVISTAR AND FI’ZI:K’S(ANTARES 00) NAIRO QUINTANA. THIRD PLACE ON THE PODIUM WENT TO QUINTANA’S TEAMMATE ALEJANDRO VALVERDE, WHO ALSO USES FI’ZI:K’S POPULAR ANTARES 00 SADDLE. "The Gorilla" Andre Greipel of Lotto-Soudal Pro Cycling Team going toe to toe with the world's greatest sprinters - Mark Cavendish & Peter Sagan - riding his Ridley Noah SL equipped with Campagnolo Super Record 11 gears. A see-saw battle is brewing between him and Peter Sagan changing Green jersey (Points) stage after stage. - Photo from Ridley Bikes FB page. Cebu's very own Ana Patricia "Ica" Maximo brings home 3 medals with class & style in the 2015 Philippine National Games Cycling Championships. The fourth year high school student of Sacred Hear School- Hijas de Jesus has broken her previous personal record of two medals in the 2013 PNG track Cycling in Quezon City and also during the 2013 & 2014 of Batang Pinoy National Finals. Keep it up Ica!! Kudos to your victory and personal best win in the PNG Games. On the first rest day, BORA – Argon 18 sees itself on track in his second Tour de France in a row. Despite bad luck with defects, crashes and an infection in the early days, the team around leader Dominik Nerz performs as planned for the targeted placement in the Top20 of the GC. In the Tour’s only bunch sprint, debutant Sam Bennett was able to finish in the Top10. BORA – ARGON 18 was awarded twice with the red number of the most active rider as the only team of the Tour. 7 out of 22 teams will start in Utrecht on fi’zi:k saddles: AG2R La Mondiale, BMC Racing Team, Cannondale-Garmin, FDJ, Movistar, Orica GreenEDGE and Team Sky. Among this army of athletes we also have some shoe ambassadors, including Geraint Thomas, Luke Rowe, Rohan Dennis, Jérémy Roy and Pieter Weening. - CLICK LINK for more!! professional cycling team BORA – Argon 18 has selected its nine riders with whom the 102nd edition of the Tour de France will be tackled. Four German riders provide the largest contingent of the wildcard team. With the only 22-year-old neopro Emanuel Buchmann, BORA – Argon 18 presents one of the youngest participants of this year's Tour de France. While Sam Bennett will also make his debut at a Grand Tour, the remaining riders of the selection had already 22 appearances at three-week races. Why Saris ? - this is why! !